Taipei, Taiwan, April 01 2011 - GIGABYTE INC., a leading manufacturer of motherboards and graphics cards today announced a new line of 16 “Black Socket” motherboards previously unveiled at CeBIT 2011 that offer support for AMD’s next generation , 32nm AM3+ CPUs and are based on current generation AMD 800/700 series chipset-based motherboards. 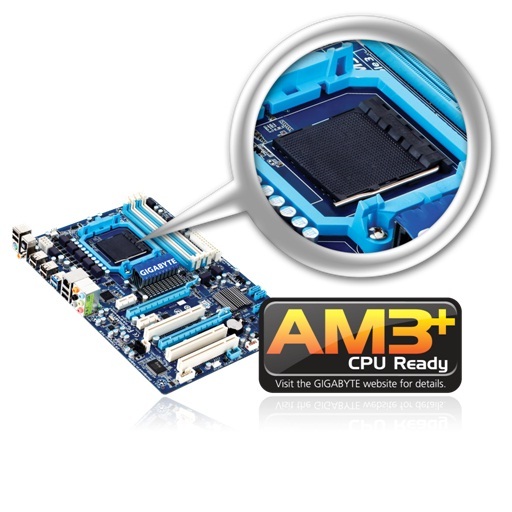 Wanting to ensure users their motherboard is able to take advantage of all the performance enhancements that AMD’s upcoming AM3+ CPUs have to offer, GIGABYTE has equipped their entire line of AM3+ CPU ready motherboards with a new black colored socket, making it easy to spot for AM3+ support. In addition, GIGABYTE “Black Socket” series offer full backwards compatibility with AMD’s current generation AM3 socket CPUs, allowing for painless migration to the AM3+ CPUs when they become available. GIGABYTE Technology Co. Ltd., headquartered in Taipei, Taiwan, is known as a leading brand in the IT industry with branch offices located in 24 countries around the world. Founded in 1986, GIGABYTE started as a small research and development team and has since taken a position as one of the in the world’s top motherboard manufacturers. In addition to motherboards and graphics cards, GIGABYTE further expanded its product portfolio to include notebook and desktop PCs, datacenter servers, networking products, mobile handsets, and home entertainment devices to serve each facet of the digital life in the home and office. Everyday GIGABYTE aims to “Upgrade Your Life” with innovative technology, exceptional quality, and unmatched customer service. Visit www.gigabyte.com for more information. « “LEXMA” ปล่อย เม้าส์ LEXMA BlueTraceTM สู่ตลาดแล้ววันนี้ !